When I started acquiring my copic markers I was sort of at a loss as to how to store them so they were readily available to use and still managed to stay organized. After some searching online I found the coolest storage item ever! Studio 3 Solutions has figured out the best table top copic marker organizer I have found. It only measures abt 4.25" wide and 5.5" deep and a height of only 14". At this size, it can easily fit into a small area; even if you wanted to own more than one. (I am considering that too). It has a very cool feature of slanted shelves that are perfectly angled to keep the pens on the shelf, and the pen number easy to view. One shelf will hold 120 Copic Sketch markers! And now, for another video. This one has been requested alot lately, and though I did something similar a couple months ago, it is worth repeating. I hope you enjoy it. The image used in the video is one of my rubberstamps ready to be purchased at my stamp site: Shelley Bean Stamps. Please come check me out! Thanks for the repeat Shelley!!! 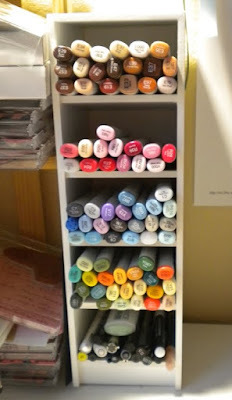 and I too think that this Copic storage unit is great!!! Can't wait till tomorrow!!!! Love, love the storage place for your markers. I might be checking something like that out for all my pencils and markers and what not. I feel like they are all over the place. Another wonderful video. I really like how you talk through each detail. Thank you for sharing!